Home > Deals	> Will You Be Getting the Ad-Sponsored Kindle 3G + Wi-Fi at the New Price of $139? Will You Be Getting the Ad-Sponsored Kindle 3G + Wi-Fi at the New Price of $139? Hmmm… Amazon has announced that their best-selling product is the Kindle with Special Offers (WiFi Only), but wonder if that will change with Amazon further decreasing the cost of the Kindle 3G, Free 3G + Wi-Fi, 3G Works Globally, Graphite, 6″ Display with New E Ink Pearl Technology – includes Special Offers & Sponsored Screensavers down to the extra special price of $139! When you buy Kindle 3G with Special Offers, you are getting the same bestselling Kindle 3G for $50 less — only $139. 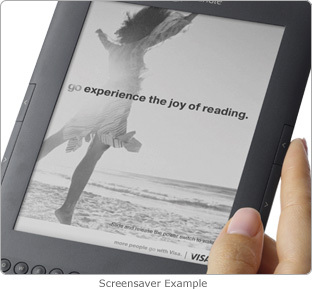 Special offers and sponsored screensavers display on the Kindle screensaver and on the bottom of the home screen—they don’t interrupt reading. Our goal is to display sponsored screensavers that you want to see. I used to think that the best deal is the $114 Kindle with Special Offers (WiFi Only), but hello, the new $139 Kindle with Special Offers 3G, Free 3G + Wi-Fi) is plenty tempting, right? How about you? If you’ve been holding off on getting a Kindle, will the new extra lower price (for the free 3G) sway you?